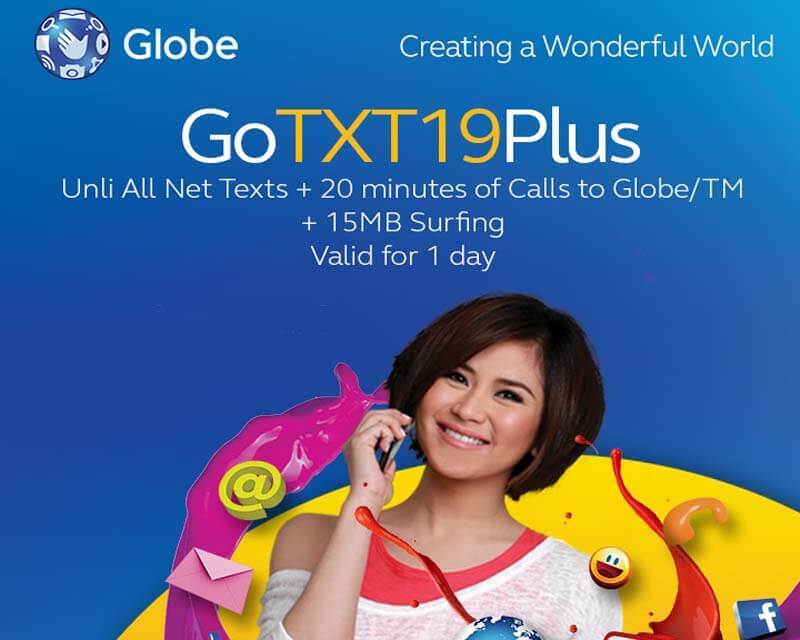 One of Globe combo promo offer that offers unlitext to all networks, call and data is the GoTXT19Plus or GO19. With your 20 pesos, you can do more than just texting as it also includes 20 minutes of the call that you can use to contact any Globe and TM (Touch Mobile) numbers. There is also an additional limited data bundle that you can use to surf the internet and access your favorite social media apps. With this GoSAKTO package, you can always stay connected to all your friends and love ones for only Php19.00. Globe also added and allowed you to call subscribers from ABS-CBN mobile and Cherry Prepaid using the allocated 20 minute call. All you need to do is reload your Globe prepaid account with 20 pesos or you can ask someone to share a load to your mobile number. You can subscribe to this promo by simply texting the keyword to 8080 or you can dial *143# menu. Just text GO19 or GOTXT19PLUS then send to 8080. To call using this promo, all you need to do is directly dial the mobile number of the contact person you are trying to call. Make sure you have a good signal reception to avoid connection issues when using data, call and text. Wait for the SMS notification from Globe before you start using the GOTXT19PLUS or GO19 promo to avoid the unwanted load deduction. Always check you load balance if you have extra regular load while subscribed to this promo.